On May 1, 1901, the Post Office Department released the Pan American series of stamps. 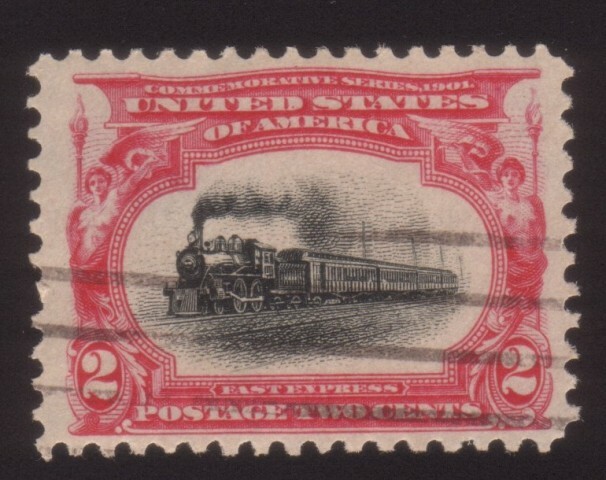 The first stamps of the 20th Century, the series featured then-modern transportation themes, ornately illustrated, and printed using a bi-color printing process. 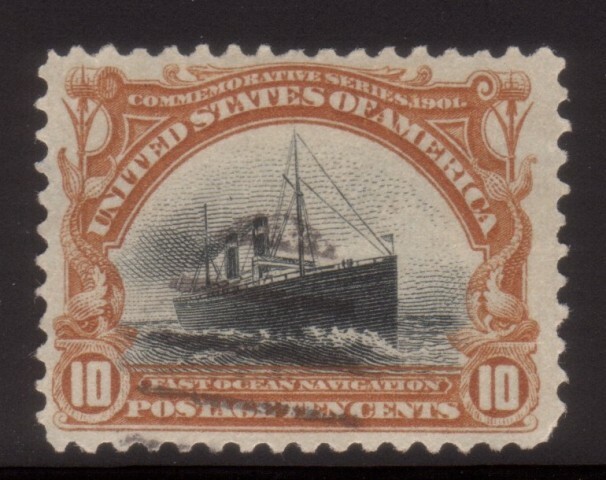 Immediately popular, the stamps remain darlings of United States collectors. The series was issued in conjunction with the Pan American Exposition in Buffalo, New York, both to commemorate the event and to promote it. The exposition was open to the public from May 1 to October 31, 1901. 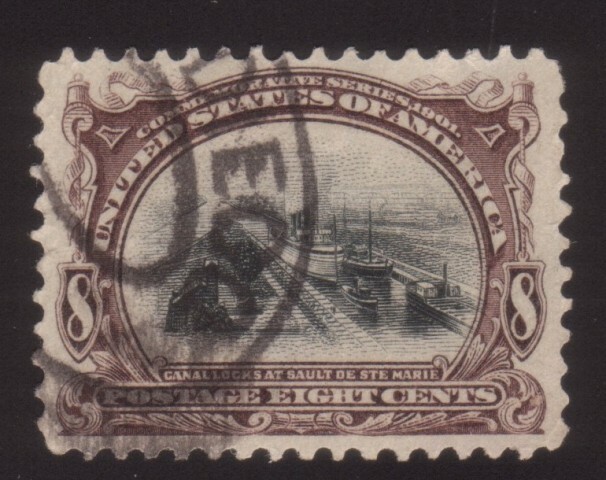 During the exposition, the stamps were available at post offices throughout the country. At the close of the exposition they were withdrawn from sale. The Pan American Exposition was a tremendous event notable in many ways, not the least of which was the assassination on September 6 of William McKinley, the 23rd President of the United States. McKinley had been a great supporter of the exposition. In the wake of the Spanish American War, the exposition's theme of a "Pan America" with expanding opportunities throughout Latin America resonated well with the President. He was standing in a receiving line at the exposition when an assassin shot him twice. He died 8 days later. More than 8,000,000 people from all over the world visited the Pan American Exposition in the six months that it was open. The event cost its promoters nearly $7,000,000. It occupied a 350 acre tract of land and the central plaza could accommodate 250,000 people for concerts and other events. The landscaping efforts were enormous. An elaborate system of lagoons and canals encircled the exhibit area, with rose gardens, flower beds, and over 800 pieces of statuary throughout. Thousands of exhibits from the nations of the western hemisphere, celebrated the coming of the 20th Century. The Argentine Republic, Canada, Cuba, Ecuador, and the Philippines were among the many nations represented, as well as the United States and its territories of Guam, Hawaii, Porto Rico, and Tutuila. Some notable exhibits included: the akouphone (hearing aid), color printing, drinking fountains, the electric typewriter, the facsimile telegraph, instant coffee, motor bicycles, steel bridges, and storage batteries. The Buffalo of 1901 was a city on the cutting edge. With the world's fourth busiest waterfront, and a wealth of available rail service, it was one of the nation's leading market centers, dominating trade for such commodities as coal, flour and sheep. The availability of cheap hydroelectric power from Niagra Falls fueled its massive iron and steel industries. In all, Buffalo provided the perfect backdrop to an exposition that trumpeted the technological prowess of the New World and the economic opportunities of the future. Capitol at Washington as a background. starboard bow, lapped by a rising wave. To make the stamps as appealing as possible, and to further emphasize technological progress, the stamps were printed in two colors - the subject of the stamp in black, and the frames each colored according to their denomination. Using the printing techniques of the day required two passes through the printing press in order to print in two colors. The two-pass method introduced the possibility of an invert error. 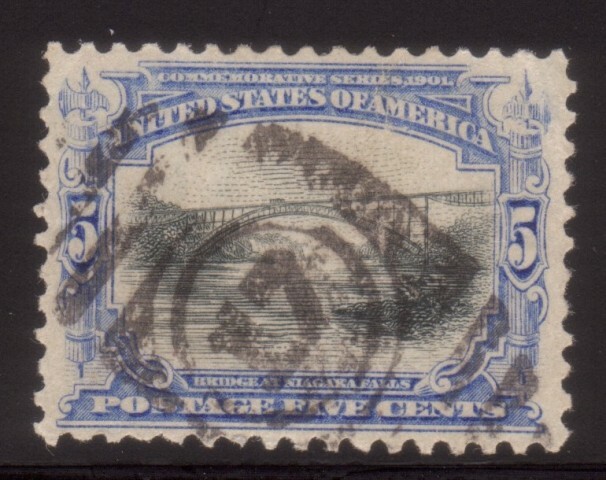 Should a sheet of stamps become reversed during the printing process, then the vignette (design) portion of the stamp would be upside-down relative to the frame. Inevitably such errors occurred. There were many conflicting accounts of the discoveries of the various inverted Pan Americans, but at the end of the day 250 of the one-cent variety and 150 of two-cent variety were known. The Post Office Department had the Bureau print an additional several hundred inverted of each denomination, and also created a four-cent invert. 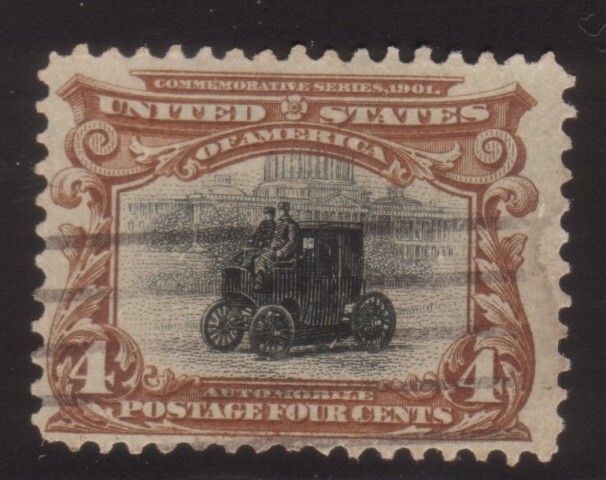 The four-cent invert was never found at a post office - only the contrived examples are known. Most of the intentional inverts were marked Specimen. The specimen copies were supposed to be used as reference examples, however, as many as 400 of the four- cent variety are now in the marketplace. The Pan American stamps have always been popular. Collectors and the general public lined up to buy them when they first became available. More than 200,000,000 of the two-cent variety were issued. They were used extensively on regular correspondence. In addition, many exhibitors from the exposition and other merchants used the stamps on ornately decorated advertising materials that are quite desirable today. 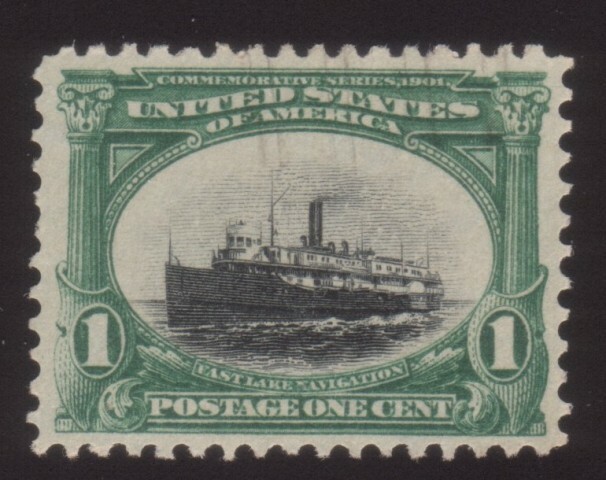 Unlike earlier exposition stamps - the Columbian and Trans- Mississippi issues - the Pan American series contained no very high denominations. As a result of its initial popularity and lack of high denominations, these stamps exist in fairly decent numbers in all denominations. Therefore, this fun and attractive set remains within the financial reach of most collectors.